OK. Thank you to everyone who voted on the book covers in the last few weeks. In addition to comments on the blog, I had lots of emails, votes on the official voting page, and comments on Facebook. In all, about 55% prefer the first book cover (with icons; without a guy looking off a building). There was some discussion the the icons looked old school but I never got good feedback on whether that's good or bad. I also got a few comments that they looked modern and new. I don't know enough about icons to understand the discussion. Anyway, it looks like Cover A is the favorite. But since I had Sally start working on another design, I thought I'd throw it out there as well. Option 1 A is the original. Option 1B is a lighter color (blue). Sally will choose the actual color. Option 1C is black, which I somehow like more than dark gray. Option 3 is the totally different cover. Maybe none of this matters given the cover artwork I see on Amazon - and the fact that my book will probably never actually be in a book store. But I appreciate your feedback! 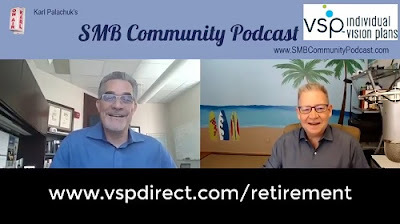 Over at SMB Community Podcast, I posted an interview I did with Al Schubert, Sr. VP and General Manager of the Direct to Consumer Strategic Business Unit at VSP Individual Vision Plans. You can also view it on my YouTube channel. Earlier this year, I worked with VSP to create a resource guide about preparing for retirement when you’re self-employed. After all, it’s a lot different from folks who receive a regular paycheck. Download the resource guide at www.vspdirect.com/retirement. VSP has a national program for vision care that is focused entirely on individuals and their families. They've engaged me to help get the word out. As a self-employed business owner, you've put in a lot of hard work to get to the point where you are actually looking at retirement. Now there's a payoff you might not have expected: flexibility! For example, with a VSP Individual Vision Plan, you don't have to worry about once-a-year opportunities to sign up for coverage. You can enroll anytime by visiting VSP Direct to sign up. Enrollment is open year-round and only takes five business days for your benefits to kick in. Here's the deal: In the 21st century, you can choose to sell your business, take on a partner, pass it on to your children, or slowly downsize. You can continue working at some level for as long as you want. If you truly love your business and your clients, you have lots of options. As with everything else, I encourage you to move to retirement with intention. Don't just let it happen to you. Choose what you'll do. I hope this free resource gives you some ideas. Get the PDF immediately at www.VSPdirect.com/retirement. Which Book Cover Should I Use? 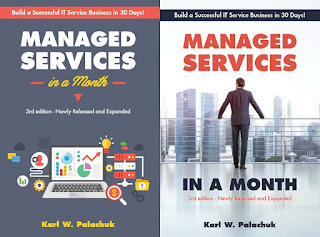 - Managed Services in a Month - 3rd ed. I've hinted here and there. 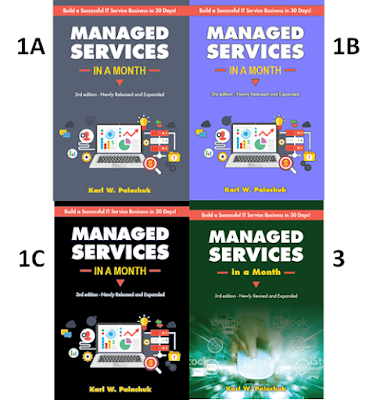 So here's the announcement: The 3rd Edition of Managed Services in a Month will be out in December. 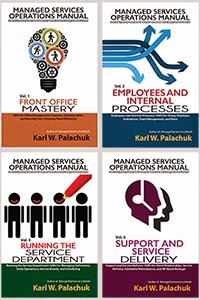 It will have TEN new chapters and is truly the complete guide to managed service. 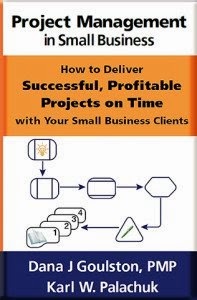 In fact, if the title "Managed Services in a Month" hadn't already been the best selling managed services book on Amazon for almost ten years, I would change the title to The Complete Guide to Managed Service. Right now, the book is going through proofreading and layout. And of course we need a book cover. I asked my graphic pro Sally Galli to come up with a few designs. Unfortunately, I like them both. I do have my own thoughts on both, but I want to hear what YOU think. After all, if you're reading this blog, you're the audience, right? Here's how you can help me pick a book cover. Choose your preference (A or B) and any comments about changes you recommend. Fill out the official survey here. The survey does NOT ask for your contact information. The only required question is which cover your prefer. Or you can just email me - karlp@smallbizthoughts.com with your preference. I am happy to announce that Mr. Richard Tubb and I have teamed up to provide a "What's Going On?" segment on Auvik's new podcast. The new podcast is called Frankly MSP. Auvik announced the podcast Tuesday on their blog at https://www.auvik.com/media/blog/tech-podcast-msp/. The podcast will also be available on iTunes, of course. In Episode One, Richard and I talk about password policies, creepy artificial intelligence, connecting Alexa to your ticketing system, and more. Then host Jennifer Tribe interviews Kevin Royalty (Total Care Computer Consulting, Cincinnati) about expanding your offerings by partnering with other technician who have specialty offerings. After that, Auvik is planning two more episodes immediately to kick off their new podcast. Please check it out. Subscribe on iTunes!